He name is Ciara and she's a 17-year-old with a terrier 5 cleft and amniotic band syndrome, and her dream is for Daryl from The Walking Dead to shoot her in the head with a crossbow. A facial cleft is an opening or gap in the face, or a malformation of a part of the face. Facial clefts is a collective term for all sorts of clefts. All structures like bone, soft tissue, skin etc. can be affected. Facial clefts are extremely rare congenital anomalies. There are many variations of a type of clefting and classifications are needed to describe and classify all types of clefting. 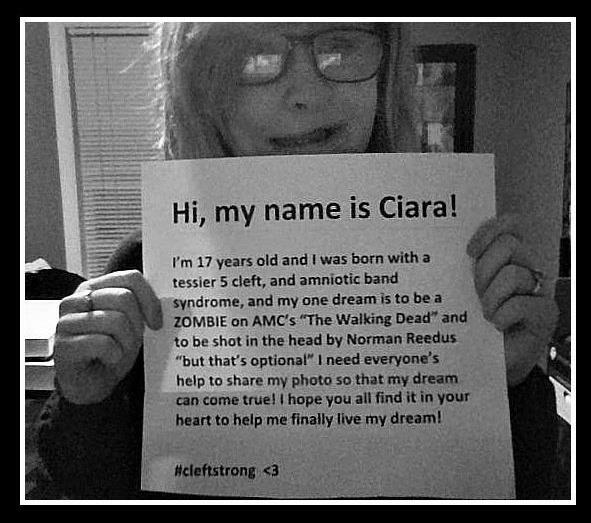 Ciara's encouraging people to share her message with the hashtage #Cleftstrong in hopes some at The Walking Dead sees it.